What Noises or Smells Do Sharks Hate? Ever since the movie "Jaws," millions of Americans have been terrified of swimming in the ocean. Well, maybe it's not really that extreme, but could you deny you think about sharks every once in awhile as you swim in the ocean? Shark researchers have been working on ways to repel sharks with noises and smells and the results may surprise you. Ever since World War II, researchers have sought ways to repel sharks after a horrible sinking of a Navy boat resulted in hundreds of survivors floating in the water and dieing from shark attacks. In the ensuing years, researchers found that sharks were repelled by the poison emitted by the Moses sole fish. Noticing that Moses sole poison has soap-like qualities, one scientist made another discovery: that sharks hate soap as well, according to Discovery Channel. It's not clear, however, if it's the scent of the soap or the Moses sole itself that sharks hate. It also may be that the substance irritates a shark's skin. As reported by Discovery Channel, the first significant discovery was that sharks hate the smell of rotting shark carcasses and quickly swim away from the scent. According to "Time" magazine, in 1945 Navy researchers found that rotting shark carcasses off the coast of New England successfully drove sharks away from fishermen's nets. Formulating a man-made repellent based on this scent that was 100 percent effect, however, proved elusive until recently. According to WESH-TV in Orlando, in 2005 Florida scientists achieved encouraging results with a repellent based on chemicals found in shark carcasses. 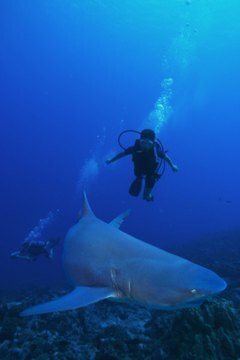 Sharks appear to dislike the noise of the bubbles scuba divers create as they breathe underwater. One researcher also found that playing the AD/DC song "You Shook Me All Night Long" did not repel sharks, but did seem to calm them and make them less aggressive, perhaps because they were curious about the sound. Sharks often decide not to attack if multiple dolphins are in the neighborhood. One theory is that they don't like the noises dolphins make. Dolphins have been known to ward off shark attacks directed at humans. One such incident was reported by NBC's "Today" show in 2007. However, sharks are also known to kill or attack individual dolphins occasionally. It may be that sharks, who are solitary by nature, view a school of dolphins as a formidable foe.